Cowin E7 is an all-rounder headphone. Although the appearance of the headphone is slightly marred by the used of plastic bits, it is quite sturdy, nonetheless. The sound is deep, warm with clear vocals. The mid-tones is where the headphones truly shine. The battery life of 30 hours is quite impressive too. 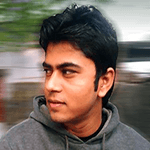 Has NFC pairing for easy and quick connectivity. Excellent mid tones and volume range. Effectively filters out ambient noise. The 2018 upgraded E7 Pro is blessed with a great and well-balanced sound quality, something even the most luxurious Bluetooth ANC headphones lack. However, bass music lovers will find the bass tones of E7 deeper and punchier. In terms of design and comfort, though, E7 Pro is a clear winner over E7, due to its thicker and more breathable padding. 23+ hours of battery even when the battery-hungry ANC feature is on. Noise filtering ability is great is moderately noisy environments. If you are looking for a mid-range headphone that looks super expensive and is extremely durable, E8 could be your go-to headphone. However, unlike E7 and E7 Pro, it doesn’t have NFC pairing for quick connectivity. The 20+ hours of battery runtime is also not on par with that of E7 and E7 Pro. However, E8 is more comfortable to wear for a long time. Clear mid-tones and well-defined vocals are its major strengths along with decent noise filtering ability. Large and amply padded earcups. Even though all the three headphones featured in this list are a class of their own, there are specific features that make one better over the other for certain users. In this section, I’ve broken down their respective salient features in detail to help you make a decision you won’t regret. As someone once famously said, life is too short to listen to music through bad headphones. The quality of sound can make or break a headphone. It is not easy to choose a Bluetooth ANC headphone that sounds great. But fortunately, E7 is a clear exception. It produces deep sub-bass and dynamic mid-bass, adding a lot of clarity and punchiness to the audio. E7 Pro’s sound output is mainly characterized by punchy bass, great mid-tones, and highs. It is essentially a mid-rangy headphone in terms of sound and is best for listening to dialogue-driven content. E8 boasts of exceptional mid-tones and great vocal clarity. The audio output remains the same in both the wired and wireless mode (with ANC turned on or off). A good ANC headphone lets you focus on your work and get immersed in your music among all the hullabaloo of crowded roads, office, airport and road traffic. But a great ANC headphone lets you take a nap in moderately noisy environments. Cowin E7, E7 Pro and E8- all three of them have an excellent ability to dampen noise in noisy places like busy streets and airport terminals. But while E7 Pro and E8 merely dampen the noise of people chattering, engine sound, honking cars when the music in on, E7 manages to create a layer of noise protection around your ears even when the music is off. 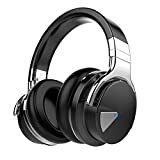 Cowin E7 original Bluetooth ANC headphones are simply the best out of three if all you need is peace of mind while traveling in public transports. Both E7 and E7 Pro offers 30+ hours of battery life. But E7 Pro uses a 25% larger battery than that of E7. Although E7 Pro takes 4-5 hours to charge which is a lot, it also reduces battery consumption in ANC mode by liming maximum volume output. E7 has one unique feature which people like me who remember to charge their gears at the 11th hour will adore. I’m talking about the Quick Charge technology. With just 10 minutes of charging, E7 allows a playback time of 1 hour. Compared to these two, the 545 mAh battery housed in E8 is subpar. The runtime of 20+ hours is not bad per se. At moderate settings, it will last you for a full day and it also doesn’t take more than 2 hours to charge which is a big advantage. In general, closed-back headphones aren’t considered to be as comfortable as in-ear phones. They are more popular for noise cancellation as they completely seal your ears. The comfort of closed-back headphones like this mainly depends on the quality and quantity of padding on the earcups and underneath the headband. The adjustability of the headband also plays an important role in this. Taking all these factors into account, I’d say Cowin E8 is one of the most comfortable ANC wireless headphones in the market right now. The large, generously cushioned earcups wrap your ears like a warm blanket. E7 Pro is less comfortable than E8, due to the size of the headband. I won’t recommend it for individuals with large heads. However, the padding is quite breathable due to its quick heat dissipation property. E7 doesn’t score high in the looks department. The excessive use of plastic part makes it look kind of cheap. However, the headband is highly adjustable and can easily fit heads larger than average in size. Cowin E7 is one of the brand’s most famed ANC over-ear headphones while E7 Pro is an updated version of it. When we say “updated”, the expectation inevitably soars high. So in the following section, we’ll try to find out whether E7 really lives up to its “Pro” status or is the original E7 still the best way to go. The 2018 upgraded E7 Pro boasts of some significant improvements of E7. Things I didn’t like in particular about E7 are the quality of padding around the headband and earcups, quality of phone calls on the microphone and the cheap plastic bits. The E7 Pro has a sturdier and more professional look. The microphone is significantly more powerful. The earcups snugly embrace your ears and don’t seem to fall off when you walk fast. As far as comfort is concerned, E7 PRO is far superior compared to E7. The ANC of E7 PRO, even when the music isn’t on is fairly powerful. It also achieves to prolong the battery life in the ANC model by limiting the volume output. So while both E7 and E7 Pro provides the total battery life of 30-hours, E7 Pro’s battery is more long-lasting in the ANC mode and thus, is more value for money. Coming to the sound, E7 PRO’s bass is more boosted than that of E7. If you are not a basshead, you will end up liking E7 more. However, just like E7, you can’t take E7 PRO out for jogging with you or use during an intense workout. Both headphones are quite competitive in their respective terms. However, E7 PRO is more value for money due to the comfort, rich bass, and powerful microphone. Cowin E7 or E8- a topic that can lead to a heated argument among audiophiles anytime. Well, to get an accurate answer, ask yourself, what features do you require the most in a headphone. If it is plush design, great comfort, excellent ANC and quick charging-E8 should be your go-to option. However, it includes a voraciously hungry battery. When the ANC is on and the music is getting played at max volume, the battery will drain too fast. E7, on the other hand, is a complete headphone. It sounds good, the ANC is above-average, comfort is average but the battery life is excellent. If good sound with great battery are your priorities, E7 wins by a great margin in the E8 vs E7 competition. E7 Pro is an above average ANC headphone with great audio output. The slightly overemphasized lower frequency range and sharp mid-tones adds a great deal of depth and dimension to the vocals and lead instruments, especially instruments like bass guitar. The battery life is excellent and it has NFC pairing too for instant connectivity. The quality of calls and audio recorded on the microphone and crisp and clear. E8 is better at noise cancellation. It can dampen the noise level by 3 dB which is enough to keep you stay focused and relaxed in crowded places. Due to the large size and thick padding, E8 is more comfortable to wear for extended hours. So no prizes for guessing, in the Cowin E8 vs E7 Pro comparison, I am slightly more inclined towards E8 for its gorgeous design and extraordinary noise dampening ability. Cowin E7, E7 Pro and E8 are three of the most talked about and sought-after active noise cancellation headphones of today’s time. You must be wondering what makes these 3 stand out in a market flooded by technically sound, aesthetically-rich headphones? Active noise canceling headphones are a godsend for daily commuters, or someone simply like me, who needs pin-drop silence to focus on work. The market these days is literally flooded with wireless Active Noise Cancelling headphones, each promising a unique set of features and superior audio performance. But we all know that most of them do not give a bang for the buck. Some of them look super fancy but sound like cheap headphones. Alternatively, some sound just fine but don’t block the external noise at all. 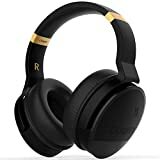 After spending countless hours researching, I finally came across Cowin E7 Bluetooth wireless headphones that completely changed my POV about these garish ANC Bluetooth headphones. For a change, it actually rings out a clear bass-driven sound, blocks a decent amount of ambient noise, feels comfortable to wear for a long time and the showstopper being- its exceptionally low price tag. One of the most adorable things about most Cowin headphones is the simplicity of their designs. However, by simple, I don’t mean vanilla. The E7 Bluetooth headphones look fairly stylish with a reinforced metal headband, nicely padded swiveling earcups and straightforward controls on the right earcup. The body is crafted from metal and plastic parts. It looks sturdy enough to last you for years unless you frequently drop it from a good height. I could have done without the plastic but the makers had to do some cost-cutting to keep the budget under check. Moreover, the glossy finish on the headphone makes it susceptible to unsightly fingerprint marks. Not that I care about this much but it would have nice not to get my headphones dirty that easily. Never you mind. E7 headphones are currently available in 5 color variations- black, white, red, purple and blue. While the black one is my personal favorite, I’ve checked the red one out too and it gives you the “expensive” vibe at the very first glance. The rotating earcups might sound like an insignificant addition but trust me, once you get used to swiveling earcups, you won’t go back any headphone that doesn’t have this feature. It drastically enhances the comfort and makes wearing the headphone for a prolonged time easy on your ears, head, and neck. Swiveling earcups rotate easily to make the gear more compact for easy portability. However, they do not fold at the hinges, a minor drawback on the design front that I can easily get past. Talking of comfort, let me point it out to you that the padding on and around the headband and earcups aren’t memory foam. But as long as it feels nice and cozy on my ears, I don’t really mind what the cushioning is made of. The padding is soft and reduces the clamping effect BT headphones are infamous for. If comfort is at the top of your checklist, you may check out COWIN E7 Pro [2018 Upgraded]. It has better cushioning and the headband does put a good amount of pressure on the head. Thankfully, the size adjustment mechanism on the headband works smoothly. By stretching the headband, I can fit the headphone snugly around my ear and neck. Note that my head is slightly bigger than average male head size. When you talk about the design of a headphone, breathability is a topic we often forget to discuss. But for someone like me who tends to sweat a lot, even in mildly cold weather, breathability is just as important as good sound. Over-ear, sealed headphones are least ideal for intense work-out sessions at the gym or even jogging. E7 Active Noise Cancelling headphones are not an exception either. As long as you are stationary or walking at a normal speed, the headphones feel steady and don’t sweat your ears. But if you are looking for gym-ready gear, your best bet would be in-ear phones. Easy control and fuss-free operation are two of the most crucial E7 specs. The left earcup houses the button layout for volume adjustment, track change, ON/OFF. It also features two dedicated switches for Active Noise Cancellation and Bluetooth pairing. Although the buttons are quite responsive, I have an issue with the placement of the volume control buttons. Unless you are a tech nerd, it might take you a while to get the hang of which button does what. I need you to remember that you need to hold each button to work instead of pushing it with all the energy in your body. On the brighter side, the volume control works in both wireless and wired mode. The headphone connectivity in wireless mode is above average. For BT, Cowin has opted for version 4.0 along with NFC pairing. For those who don’t know what NFC is, it is a technology that allows to BT-enabled devices to pair up when they are within the 4 cm distance of each other. The NFC makes pairing the headphone with smartphones a breeze. The BT range is nothing to go crazy about. However, the pairing up process is quick and unless there’s a physical obstruction between the headphone and the paired device, you don’t have to worry about losing signal. I did notice a sound delay while playing movies and video games. However, the latency doesn’t affect the music listening experience at all. The built-in Cowin E7 microphone delivers enough intelligibility but the overall quality of calls aren’t quite up to the mark. I had to ask “can you hear me?” to the person on the line probably ten times during the call. I hope you understand I’m trying to say here. The headphone comes with a 3.5 mm cable but no USB adapter or in-line remote. You will have to power on the device to use the wired mode. One department where Cowin E7 absolutely shines is the battery life. It sports a Quick Charge system which allows 1 hour of playback time with just 10 minutes of charging. So even if you are in rush and forget to charge the headphone, 10 minutes are all you need to get the device travel-ready. When fully charged, it provides a whopping runtime of 30 hours. Even if you use the highest settings for prolonged hours, the battery should last for at least 20 hours. Now, let’s throw light on the most talked about feature of this headphone- the E7 ANC. When you switch the ANC mode on, it actively isolates the ambient noise, such as the sound of people talking, gurgling noise of the engine and so on. The sound isolation is above average in a relatively less noisy environment. If you are walking on a crowded road, the surrounding noises will be audible to some extent. However, for the price, the noise dampening level is respectable for day-to-day use. If you struggle to concentrate while reading books or working due when people are talking near you, this headphone serves the purpose well. Thanks to the design of the circumaural earcups, the sound leakage is minimal at low to medium sound settings. However, in a quiet place, the sound at max volume will be audible to people around you. The clarity of sound is surprisingly good in the ANC model. To be honest, I wasn’t expecting this a tall, given Cowin E7 price. My phone’s speaker is average at best so the full credit for this obviously goes to the headphone. Cowin E7 review, or for that matter, any audio gear review. would be incomplete without this segment. E7 doesn’t have an open soundstage(partly due to the closed-back design) and the sound distortion at highs is quite tangible as well. Never you mind, the mid-bass is punchy and the music has a kick EDM-heads look for. However, the mid-bass can be overpowering if you are not an ardent fan of bass-heavy headphones. The sub-bass is slightly muddy and lacks the depth. 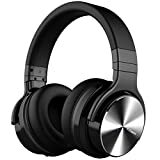 If you want the bass to be boomy with incredibly profound sub-bass, COWIN E7 Active Noise Cancelling Bluetooth Deep Bass Wireless Headphones would be a much better choice for you. The mid-bass of this headphone packs a lot of strength, making the music sound thunderous without being overpowering. Moving on, the E7 headphone under review is mid-rangy as far as the audio performance is concerned. The mid-bass adds to a lot of presence to the sound and significantly enhances the clarity of the vocals and lead instruments. I have two songs to test the bass- Brass Monkey by Beastie Boys and Insane in the Membrane by Cypress Hill. To test the sound clarity and left right speaker test, I’ve opted for Bohemian Rhapsody by Queen and The National Anthem by Radiohead. What I have observed from the above song tests is that the higher mids of the E7 are not as crisp as I’d have wanted it to be. The mid-bass bleeding is decent and vocals sound a bit laid-back. Due to the mid-bass bleeding, the sound feels warm and boxy which is actually a good thing. However, with the help of the EQ, the scenario becomes totally different. It drastically empowers the mid-bass and vocals. The EQ also significantly improves the lower mids and brings the vocals to the front. All I am trying to say is that the songs are going to sound completely different with the help of EQ. Coming to the treble performance, the response was sort of inconsistent. The low treble around 3.5KHz affects the clarity of instruments and vocals. Since E7 ear cup padding isn’t the best of its kind due to the absence of memory protein foam, you can consider replacing it with E7 Replacement Earpads Ear Pad Cushion. These cushions are made from commercial-grade protein leather and guarantee optimal comfort. The E7 comes with a basic travel pouch. If you are a frequent traveler, you need a more solid casing to keep your headphones secure. Do yourself a favor and buy a COWIN E7 Tailor-made Headphone Case or Carrying Hard Case. These two hardshell cases are tailor-made for E7 and E7 PRO. Those on a tighter budget can opt for Ginsco Headphone Carrying Case. It will shield your prized possession against weather elements and shocks. If you can spend just a few dollars more, go with Hard Travel Case for COWIN E7 / E7 PRO to keep your headphones nice and secure. It comes in multiple color variations as well. You can also consider Headphone Carrying Case Storage Bag Pouch if you are an avid traveler. It is made from hard nylon fabric and is spacious enough to safely hold headphone accessories such as extra cords and airplane adapters. To ensure extra comfort and reduce the clamping effect on your forehead, you can attach replacement ear pads made from high quality leather cushion. Replacement ear pads are made from protein leather which touted as the best type of padding for over-ear headphones. Long-haul flights can be exhausting without some good music to listen to or decent videos to watch. To make your plane journey comfortable, you can get yourself Cowin Airline Flight Adapter. These adapters are corrosion-resistant and are compatible with most airline jacks. Battery life of 30 hours, Quick Charging in 10 minutes. The padding is not memory foam. Every time I see “Pro” added to a product’s name, my expectations soar. Cowin E7 Pro, the 2018 upgraded version, therefore, generally fell prey to skyrocketing expectations. Did it succeed to stay to true to its name or not is the question we will be addressing throughout this review. The E7 Pro doesn’t look startlingly different from E7. There are some tiny cosmetic changes, though. For instance, the E7 Pro’s padding, made from leatherette material, is way softer than that of E7. Therefore, it’s more breathable and easier to wear for extended hours. The earcups are slightly larger than average size headphones. It works in its favor as larger earcups mean less sound leakage. Therefore, no matter how loud the music is, people around you won’t frown or scoff. This feature also plays a pivotal role for active noise cancellation. The brushed metal exterior of the earcups is a nice addition. It truly manages to add a premium feel to the gear. It is currently available in 6 colors- black, red, green, blue, purple and pink. While black will always be a head turner for me, the red is one a real eye-candy. The headband is dressed in faux leather and I have an issue with the size and adjustment of it. Unlike E7 which easily fits my large head after stretching, I can’t say the same of E7 Pro. So if you have a large head, I would say go with E7 over E7 Pro. Although the main body of the device is made from plastic, it feels quite sturdy when you take it in hand. Unless you accidentally drop it on a hard surface, it won’t snap. This much I can assure. As I already said before, ANC Bluetooth headphones are notorious for not being too comfortable. However, the thicker ear cushions included in this headphone warmly embrace your ears instead of squeezing them tightly, resulting in great comfort. Unless you have got a large head, flexing the headband will allow for a snug fit. Add to that, it has 90-degree swiveling earcups like E7 to further enhance the comfort. The feature also makes it easy to pack and carry in the solid case included in the package. However, mind you that even this headphone will eventually exert a clamping force on your temple after two hours. However, prolonged use doesn’t cause much sweating, thanks to the velour surface that dissipates heat faster. I don’t recommend it for using in the gym or during jogging. You should also put off the headphone for a few minutes after every one or two hours to avoid discomfort. Do that and it will be totally alright to wear these headphones all day long. If you hold E7 Pro and E7 profiles side by side, you will hardly notice any difference between the controls schemes of two. In fact, there hardly is any. The controls are housed on the right ear cup. There are Plus and Minus buttons for volume control, a triangle shaped button to start and stop the music. The buttons are responsive, intuitive and facilitate tactile clicks. The buttons are more well-spaced, compared to those of E7. If you are unsure about which button does exactly what, a quick read of the E7 Pro manual and tinkering with the buttons will get you used to it. Using Bluetooth 4.0 in the 2018 upgraded Pro version of E7 wasn’t a very smart decision per se. I was expecting something more advanced like BT 4.1 or 4.2. But never mind. The latency in the wireless mode is also high, even by cheap Bluetooth headphone standards. However, on the brighter side, I didn’t have any connectivity issue in both the wired and wireless mode. It allows NFC pairing as well for super quick and easy connectivity. You can’t connect multiple devices at the same time, though. Bummer, I know. Although the call quality of the microphone is above average in quiet and semi-loud environments, I found it hard to decipher the words of my caller in busy streets and airport. The speech recorded in an isolated room was very detailed and had a solid presence. This is the segment where E7 Pro truly lives up to its “Pro” status. The battery housed by the 2018 upgraded version is 25% larger than the 800 mAh battery used in E7. Although the battery is rated for 30 hours run time when fully charged, in reality, it should be around 23 hours. Not unimpressive. What makes the battery of E7 Pro better than that of E7 is the comparatively low battery consumption. It achieves so by limiting max volume output in the ANC mode. Meanwhile, among the 4 listening modes of the headphone, the AUX Cable Mode with Active Noise Cancelling OFF is the least battery-hungry. So whenever you need to save battery, you know which mode to switch to. Try to avoid using the Bluetooth Mode with Active Noise Cancelling ON mode as it eats out the battery too fast. The charging time for the battery is 4 and a half hours. I know it’s quite long but the sheer size of the battery makes it kind of obvious. I hate red-eye flights to the guts and therefore, it makes it an ideal place to check the strength of a headphone’s ANC. Even with no music, the E7 Pro effectively drowned the chattering noise, engine sound to a great extent. I could still hear the hullabaloo at the airport but the intensity of the noise was dampened. However, I would like to point out here that the ANC of E7 Pro is highly sensitive to movement. A slight nodding of your head or walking downstairs can break of noise blocking layer. The sound leakage is minimal and won't bother people around you unless you are playing it loud it a quiet environment. In case active noise cancelling isn’t a priority and all you want is good, loud and crisp music, you should check out Cowin E7 Wireless Bluetooth Headphones. The closed-back, over-ear headphones provide quite a decent tonal clarity. The sound is full, well-balanced with punchy bass. However, the sub-bass that is responsible for the thumpy and kicky feel in the music is subpar. If you love bass-heavy music, you should rather go for Cowin E7 Active Noise Cancelling Bluetooth Deep Bass Wireless Headphones. The mid-bass is fine but again, it loses some brownie points for the high-bass. High-bass is responsible for the warmth in the bass which this headphone lacks, slightly. It uses 45 mm drivers, larger compared to the 40 mm drivers used in E7. For this, the frequency response is much wider and the sound is also quite powerful. The larger drivers also make the soundstage more open and driven by boosted bass. If you don’t like boosted bass, that’s a bummer for you. The mid-range, highs and treble range, on the other hand, are quite impressive. I could clearly understand the lyrics of the songs and that’s a wonderful feeling. With EQ in your smartphone, the music gets a totally new dimension and it also lets you fine-tune the sound to your liking. Nonetheless, the sound quality is quite affected when the ANC mode is off. Therefore, in order to get an immersive listening experience, keep the ANC mode on when battery drainage isn’t an issue. Although the existing padding of E7 Pro has nothing wrong with it, you can always use some extra comfort, right? The Ear Pads Replacement for E7 Pro is comfortable to wear for long hours and provides better breathability. It also comes with a carrying case and a cleaning brush. Tailor-made Hard Travel cases and Carrying Hard Cases are also quite popular accessories among travelers. These cases are made from tough, waterproof materials and have enough space for headphone accessories and parts like airline adapters and chords. You can nicely fold your headphones inside them without detaching the chords. 45 mm drivers for the wider frequency range. Comfortable padding on the earcups and under the headband. High-bass is underemphasized, resulting in the lack of warmth in the bass. Uses the backdated Bluetooth 4.0. Cowin E8 is an officially updated version of Cowin E7. The later garnered lots of positive reviews for its powerful ANC, long battery life and bass-driven sound. E8 comprises all the features that are great about E7. But what I like even more is that it has brought some stark improvements on the not-so-good features of E7 in the E8 headphones. Cowin E8 is a perfect mid-range headphone for daily commuters who want to enjoy their peace of mind in noisy environments. But nobody buys headphones just for ANC. If it doesn’t sound good, what’s the point? Throughout this review, we will try to find out whether Cowin 8 truly manages to live up to the hype or it is just another fancy Bluetooth ANC headphone in the market. Cowin has seemingly put a lot of effort to make E8 look as upmarket and attractive as BOSE and Sony headphones. Well, guess what? The effort has paid off. E8 headphones look like a piece of art and have a more robust build than E7 and E7 Pro combined. It comes in 4 color variations, namely black-gold, black-rose, black-silver, and orange. My personal favorite model is the one with a black and gold color scheme. It has a regality in it that’s hard not to love. It’s large stature surprisingly works in its favor. Large headphones like that can house large earcups with thicker padding. This leads to great comfort and a drastic reduction of sound leakage. The ample padding on also reduces clamping sensation that results from wearing heavy headphones for long hours. Another advantage is that E8 is quite lightweight for a Bluetooth headphone of such large and robust build. The package includes a sturdy E8 case that lets you neatly fold the headphone along with all the essential accessories like cords, piano adapters and airline adapters included with the product. Even though the headband is equally well-cushioned, the padding isn’t as soft as that on the earcups. Individuals with large heads might fund the headphone a bit tight after wearing it for a long time. I wish the headband could be a wee bit more adjustable. Coming to the headphone factor, the E8 is slightly bulkier than E7 and E7 Pro. However, the generous padding on the earcups is the redeeming factor here. On the downside, the padding isn’t highly breathable, therefore, you may start sweating after a while. For the same reason, I won’t recommend it for wearing during workouts and sports. But the issue isn’t beyond repair. Since the padding on the earcups is magnetically attached, you can easily replace them with more comfortable cushions if required. You can find more about replacement ear cup padding in the E8 accessories section later on in the review. Like most Cowin headphones, the control buttons of E8 are also located on the right earcup. The tactile buttons provide good feedback. There are dedicated buttons for activities like call, skip and pause track and volume controls. The power button also enables Bluetooth pairing if you press and hold it. You will get easily accustomed to the control scheme after a few hours of use. In case of any confusion as to which button does what, refer to the Cowin E8 user manual. Cowin E8 uses Bluetooth 4.0 for connectivity which delivers enough bandwidth for good quality audio signal. You can pair up with a BT-enabled device under 10 seconds in the 33 feet range. The sound delay during video playback and gaming is hardly noticeable. However, the lack of NFC pairing makes it lose a brownie point. Pairing is much easier when you have NFC like E7 and E7 Pro have. But E8 again manages to redeem itself with the inclusion of not one but four high-quality microphones. Whether you are in a busy street or inside a crowded airport terminal, the multiple mic configurations ensure excellent call clarity by separating the voice from background noises. The multi-mic configuration results in difference of pickups, leading to superior active noise cancellation, even in severely noisy environments. The 545 mAh battery of E8 isn’t nearly as impressive as the 30-hours battery runtime provided by E7 and E7 Pro. As we all know, ANC is a tremendously battery-hungry feature. When you switch it on and crank up the volume to max, the battery drains super fast. However, if used at moderate settings, it provides a playback time of approximately of about 20 hours. On the plus side, the battery takes only 2-3 hours to receive a full charge. Cowin E8 is capable of dampening the ambient noise by about 30 dB. This may be not humongous but does serve the purpose well. Put on some music when the ANC mode is on to reap maximum benefits. It will effectively filter out the annoying humdrum of idle talking, engine noise in city traffic and sound of announcements at the airports. Now comes by far the most important section of my Cowin E8 headphones review. Cowin E8 uses 45 mm large drivers that makes the tonal clarity and volume range much better than that of E7. It is almost 30% louder than E7 to be precise. If you love bass-heavy music, this headphones won’t disappoint you at all. The low-bass responsible for the kick in music is right on point. The mid-bass makes bass guitar tones well pronounced. However, the high-bass is overemphasized by 4 dB which slightly affects the warmth of the bass tone. But the good thing is, the well-pronounced low-mids prevents the warmth from getting totally marred by the overemphasized high-bass. The mid-tones are the biggest strength of E8’s sound output. The low-mids are also It significantly enhances the vocal clarity, making these headphones absolutely perfect for listening to audio books, movies, and songs in foreign languages. The neutral low-treble range affects the clarity of vocals to some extent by it is hardly noticeable, even by trained ears. If you want a better and thicker earcup padding to enhance the breathability and comfort of E8 headphones, consider buying Cowin E8 Ear Cushion Kit made from imported memory foam. Large drivers for wider sound frequency. Only 20-hours of battery life. Choosing the right headphone is insanely difficult, especially when you have to pick among 3 extremely competitive headphones of the same brand- Cowin in this case. If your judgement remains clouded even after reading the in-depth reviews, don’t worry. I’m quite sure the side by side comparison of E7 vs E7 Pro and E8 will definitely help you make up your mind. That’s all for today. Good luck!